CounterPath's Bria softphone clients feature the same easy to use interface across all platforms which include: Apple, Windows, Android or Blackberry. With a range of licenses available, all you need to do is select the license required i.e. mobile, tablet, desktop or user license and provide your end user customer with their login credentials. 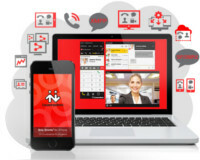 By combining video, presence and messaging, Bria softphones provide a true unified communications experience across both fixed and mobile networks. This webinar is a great opportunity for you to learn about the differences between CounterPath Bria 4 and Bria Stretto, plus see how Stretto can help you ease the deployment and administration of user licenses.